Not using heatmaps to optimize your landing pages? Here's why you should. I' m convinced we aren't getting the most out of our landing pages. I've heard that heatmap analysis is pretty effective in wringing out more conversions from pages, but I'm not familiar with how they work or which heatmap tools I should consider. Can you point me in the right direction? Answer: Landing page optimization is a critical part of online marketing success. By using Web analytics tools to create an inviting and motivating landing page, you can get more conversions from your traffic. 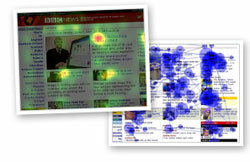 Heatmapping is one of the most effective metrics in examining how visitors are interacting with your site . By using the data they provide, you can optimize key areas of your site and increase your conversions exponentially. In the last several years, eye tracking studies have revealed interesting patterns in Web site user behavior (including the value of a Top Google Ranking ). These patterns can be translated to heatmaps that represent where most users are spending the most amount of time on your site. Although eye tracking studies are expensive to run, you can get many of the same results from heatmapping software programs that use computer algorithms to simulate where people will look. Pinpoint exactly where your links and advertisements should go. Get more visitors to complete their purchase. Get more visitors to fill out your forms. Predict how your visitors will interact with your site in the future. Make Web usability testing easy to implement.